The guides are shipped in packets of 100 (a quantity of 1 equals 100 copies). 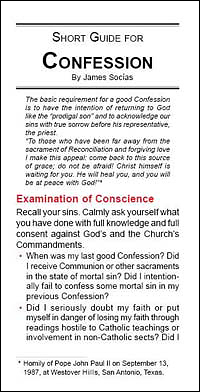 This popular, free pamphlet takes the penitent through an Examination of Conscience and the Rite of Reconciliation. The Examination of Conscience consists of a series of questions. There are instructions about what to do before, during, and after Confession. An Act of Contrition as well as the Rite of Reconciliation are included. Are only available in packets of 100, in English or Spanish. The Confession Guide has been made available as an app for iOS devices by the St. Josemaria Insitute. The Confession Guide is also available for Android devices here: https://play.google.com/store/apps/details?id=com.stjosemaria.confessionguide.